This morning could not have started off better. 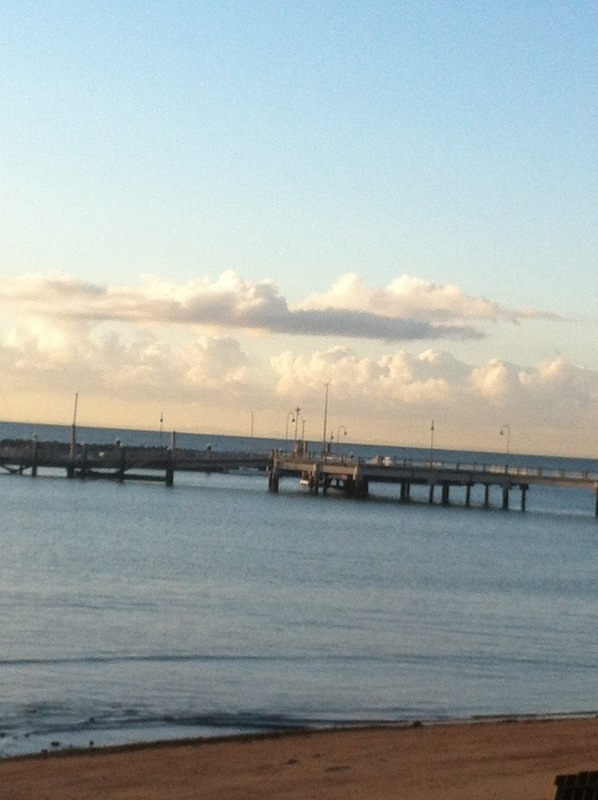 I was asked to speak at the Rotary Club of Redcliffe Sunrise (RCRS) at their breakfast BBQ on the beach! President Colin was so kind and picked me up from UQ after my class the night before and had me stay with another club member for the evening. The reason for this is because Redcliffe is about 90 minutes away by train or 45-60 minutes by car from the city which would have called for an extra early morning. 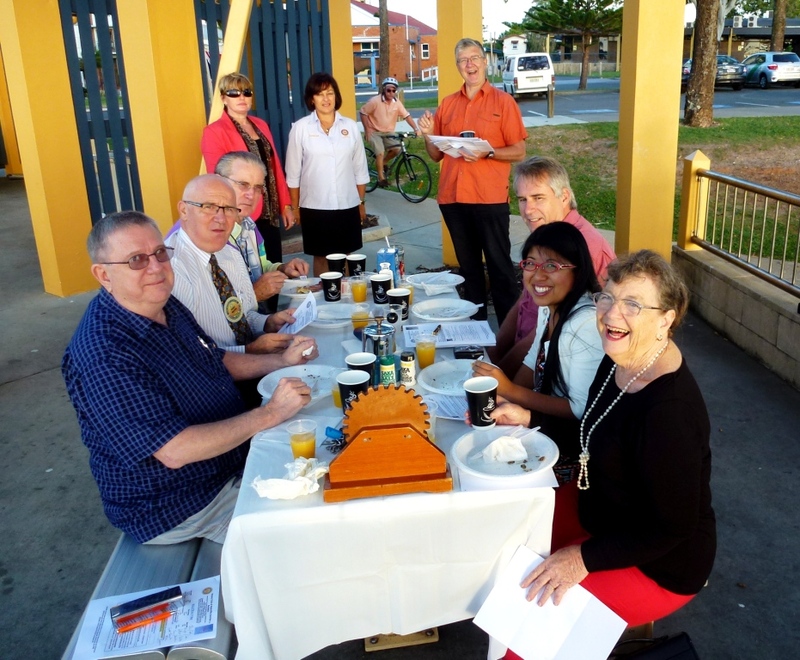 RCRS has a beautiful Rotary park right next to the beach but often meet at Reed Point Cafe for their meetings. With the nice weather, President Colin suggested a breakfast BBQ with eggs, mushrooms, bacon, english muffins, orange juice, and coffee. The idea was taken well and a great group attended. RCRS currently has 11 members and I really like how every member has an active role in the club. To start the meeting, RCRS sang the Rotary grace: “O Lord and giver of all good, we thank thee for our daily food, may Rotary friends, and Rotary ways, help us to serve thee all our days.” Then a breakfast toast was made to Rotary, the Queen, and Rotary International. The bulletin they hand out has minutes from the last meeting and board meeting, officer updates, current budget, jokes, and member information. I found it incredibly useful and saw the countless community projects RCRS contribute to such as the Rotary Flood Disaster Appeal, Kokoda Challenge Youth Project, and The Heart Foundation. Colin introduced me and I had to break it to the club that there would be no stand-up comedic act. I shared with them about how I become a Rotary Ambassadorial Scholar and how I was chosen as one of Brisbane’s International Student Ambassadors. I shared with them how many of my friends were curious about Rotary because many of them had heard of Rotary but not sure of what the organization did. 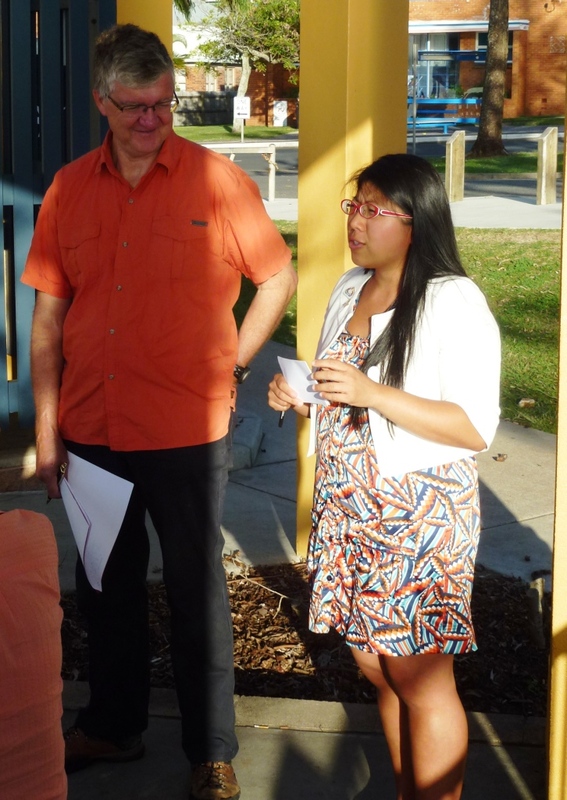 RCRS were very concerned about the future of Rotary, especially in the Redcliffe area. We discussed how to reach out to more youth and connect with other international students who could bring Rotary to their respective countries. After my presentation, RCRS played a game of two-up, which is a traditional Australian gambling game involving two coins. Everyone must decide if it will be two heads (observe), two tails (reverse), or a head and a tail (odds). The game is traditionally played on Anzac Day in pubs all over Australia. I had never played the game before so it was so much fun to take part. The winner will then pick a card from the deck and see if they have won a cash prize. Shortly after the game, we wrapped up the meeting so everyone could get to work on time. My presentations are just beginning but I am really enjoying how each club is unique in how they run their meetings and the different projects they commit themselves to assisting or running. All the members of RCRS were so friendly and I was so happy to be able to speak to all of them at some point during the meeting!